There was a flurry of activity during international week with January camps taking place at all levels in the warmth of Spain and Portugal. With the England seniors’ game against the Netherlands in La Manga taking place behind closed doors, we took ourselves off to the Algarve to watch the mini U19s tournament being held in Vila Real de Santo António. Both England and the Republic of Ireland were involved in games that would provide a strong opportunity to practice ahead of their Euro 2018 Elite Round qualifiers in April. There had been mixed fortunes for both sides on the tournament’s opening day. 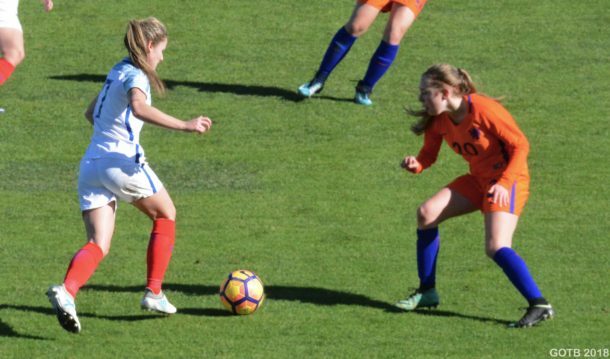 England had recovered from a goal down to draw 1-1 with Norway, with Manchester City’s Ella Toone scoring the equaliser. Ireland, on the other hand, fell to a 3-1 defeat at the hands of Portugal. The two nations went head-to-head on Friday evening in the third scheduled game of the day. England edged a tight first half and went in at the break 1-0 to the good. They had come close to taking the lead early on when Isabella Sibley’s header across goal was cleared off the line before Sunderland’s Bridget Galloway could get a touch. 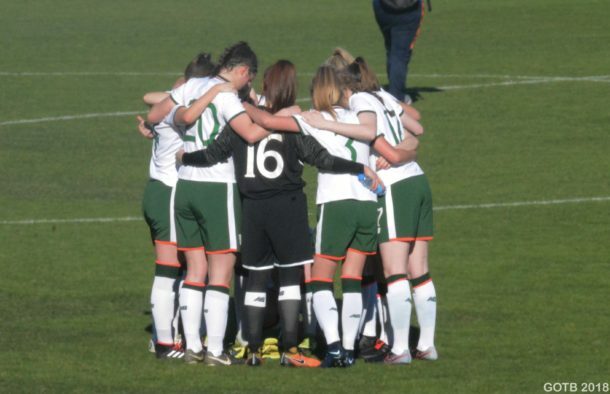 Lois Joel gave the Young Lionesses the lead with around 20 minutes played but Ireland offered a strong response and Saoirse Noonan was just unable to reach a free kick that dropped to her 8 yards from goal. The start of the second half went much the same way. Arsenal’s Anna Filbey came on for Toone and had an immediate impact in the creation of several dangerous chances. England almost doubled their lead when Galloway turned Beth Roe’s cross onto the post but it rolled agonisingly wide. A crazy two minutes of football followed. Ireland found themselves back in the game when the ever-present Noonan popped up at the far post to head home a corner. England, however, responded immediately. Breaking quickly, Jessica Ngunga was played through to re-take the lead. And it was the Arsenal forward who consolidated the victory, sending home a curling finish with about ten minutes left to play. Rehanne Skinner named six changes for England’s final game against the Netherlands. The Young Lionesses started on the front foot and seemed to catch the Dutch by surprise. Ngunga saw her shot roll agonisingly wide while Toone and Hannah Cain both had good chances. As the half wore on, the Dutch began to settle and dominate control of possession. They did have the ball in the back of the net but it was rightly scrapped off due to a blatant foul on Emily Ramsey. England’s keeper was then called into action again minutes later to save off Chelsea Kenton with her feet before captain, Ellie Fletcher, made a vital flying challenge to clear a looping Janou Levels cross. It was not all going Holland’s way, however, and England probably had the best chances to take the lead before the break. Ngunga had a shot cleared off the line with Aukje Van Seijst in no man’s land before the Dutch keeper made a fantastic stop to tip Toone’s effort over the bar. Within minutes of the re-start, Fenna Kalma had the ball in the back of the net again but it was ruled out for offside. It was a warning of what was to come, however, and she gave her side the lead shortly after, turning a low effort home. The Young Lionesses mounted a strong challenge as the game came to close. Everyone in the stadium must have thought Cain’s curling effort was destined for the back of the net but it just failed to dip at the end and cannoned off the crossbar. It was a shame as her performance over the 90 minutes was well worth a goal. Roe also saw a shot from distance saved as England ran out of time to find an equaliser. Ireland U19 manager, Dave Connell, made plenty of changes for Ireland as they looked to avenge their opening day defeat against Portugal. The in-form Noonan remained a constant, however, taking up the role as lead attacker. They got off to the worst possible start when Joanna Martins was brought down in the box five minutes in. She picked herself up and made not mistake in converting the subsequent spot kick. Having taken the lead, Portugal did not let up and continued to press as Ireland struggled for the ball. Paula Fereira produced a dangerous free kick that was saved by Naoisha McAloon before Leanna Rembibas saw an effort blocked. Their second goal followed with half an hour played. A quick break saw Eva Carvalho look to lob McAloon. The Irish keeper managed to get a glove to it but could not prevent it from crossing the line. Connell made a significant number of changes before the second half, most notably introducing Megan Mackey and Alannah McEvoy to support Noonan in attack. They had both impressed against England three days before. Ireland played with more impetus in the second half and managed to bring themselves back into it when Noonan converted a fine strike to make it her third of the tournament. As Ireland searched for the equaliser, they left themselves open to the Portuguese counter and the hosts extended their lead in injury time. A sweeping move ended with Juliana Domingues firing home to make the final score 3-1. While not the results that either team necessarily wanted, this friendly tournament will have provided the perfect start to a busy year. There were positives for both sides as well as plenty to build in ahead of qualifying. England will head to La Manga for another friendly set of fixtures in March. They will face the USA, the Czech Republic and France in their week in Spain which will give them another big test before they head to Slovakia in April. The Republic of Ireland meanwhile have not announced any friendly fixtures yet but will surely look for more games ahead of hosting the Elite Round. Tagged algarve, england, football, International football, lionesses, love football, republic of ireland, u19s tournament, women's football, young lionesses.